International migration and corruption have several things in common: they play key roles in development processes, feature prominently on policy agendas, and are the subject of large research literatures. However, the connections between migration and corruption, whether in the country of origin or along migration trajectories, remain relatively unexplored. The migration-corruption nexus has important implications for migrants, policymakers, practitioners, and local communities affected by emigration and immigration. Although focused attention to corruption remains rare in migration research, corruption frequently comes up as a topic because it affects people’s lives. For instance, one of the studies that inspired this article set out to examine the reintegration of return migrants and discovered that corruption was an overwhelmingly important issue, not foreseen at the outset. The concept of a nexus implies that there are many connections and that the effects go in both directions. Migration can affect both the practice and perceptions of corruption. And conversely, corruption can induce, facilitate, or obstruct migration. Corruption can also modify the effects of migration on society. This article outlines ten specific ways in which corruption shapes migration or vice versa, before exploring three case studies that illustrate some of these effects and demonstrate how the connections manifest in specific settings. But first, what exactly is corruption? The word corruption has resolutely negative connotations. Corrupt behavior can facilitate illegal and harmful practices such as human trafficking. Then again, in other circumstances, what is corrupt in the eyes of one person might be viewed differently by another. If personal connections or an implicit exchange of favors make it possible to cut through red tape and, say, construct a hotel, the people involved might see it as a pragmatic solution that they would not think of as corruption. Or, for example, paying a bit more to get a service done quickly may be seen as a more efficient solution or a necessary evil within a society where such actions are a common lubricant. Migration brings together people with different backgrounds and perspectives, and varying ideas about what constitutes corruption. This is not only the case at migration destinations, but also in the communities at origin, as those who have left and potentially acquired new perspectives retain transnational ties, possibly transferring their (new) ideas back to their origin countries. There are many ways in which corruption and international migration may be linked. This article concentrates on a simple point at the national level: countries where corruption is perceived to be widespread are largely countries of emigration. Conversely, countries where corruption is perceived to be less of an issue are primarily countries of immigration. Figure 1 displays this general relationship. Most countries with severe corruption problems are located on the left-hand side of the figure, with greater emigration than immigration. In the lower-left corner are countries with particularly severe corruption and high emigration, including East Timor, Guyana, and Sudan. At the other extreme, in the upper-right corner, are countries with very little corruption and high levels of immigration, such as Singapore, Luxembourg, and Switzerland. The dashed line across the figure shows the general relationship between corruption and net migration, calculated on the basis of all the country data. Notes: The Corruption Perceptions Index (CPI) ranks countries and territories based on how corrupt their public sector is perceived to be. A CPI of close to 0 indicates that the public sector is perceived to be highly corrupt; a value close to 100 indicates that it is perceived to be very clean. The Net Migration Rate (NMR) is the number of immigrants minus the number of emigrants per 1,000 people. The figure displays 174 countries and territories for which NMR and CPI data were available. Three outliers with a NMR of more than 100 were not included in the analysis (Lebanon, Oman, and Qatar). Source: Transparency International, “Corruption Perceptions Index 2012,” accessed March 1, 2015, www.transparency.org/cpi2012/results; and The World Bank, “World Development Indicators,” accessed March 1, 2015, http://data.worldbank.org/indicator/SM.POP.NETM. As discussed below, corruption can encourage emigration and inhibit return. However, migration flows are shaped by many other powerful forces. The pattern shown in Figure 1 should therefore not be seen as a sign of causality, but as demonstrating the point that the countries that migrants leave, and possibly return to, tend to have higher levels of corruption than destination countries. The migration-corruption nexus is characterized by crisscrossing causes and effects. The mechanisms differ in terms of their consequences for migrants, governments, and local communities. These are not strictly rank-ordered but start with the most established connections. Circumventing laws and regulations is a key motivation for bribery, and the field of migration is no exception. Corrupt officials can, for instance, produce false documents, turn a blind eye to human smuggling, or shield employers of unauthorized immigrants. In these and other ways, corruption stands in the way of orderly migration management. This is the most widely acknowledged connection between corruption and migration. The flip side of the previous point is that people with a well-founded fear of persecution often depend on corruption in order to seek protection in another country. European countries, for instance, actively limit the number of asylum seekers by making it as difficult as possible for prospective candidates to reach European borders and seek asylum. Paradoxically, the most professional human-smuggling services, which are often greatly dependent on corrupt officials, offer the safest forms of travel. This is because high-quality forgeries and well-placed collaborators can ensure travel by regular means of transportation. Migration can alleviate poverty and promote development, especially through remittances, investments by migrants, and development initiatives by diaspora groups. This potential is undermined by corruption when migrants’ money is siphoned by self-enriching people in trusted positions in origin societies. If bribes are required for construction permits, licenses, or planning permissions, for example, the benefits of migrant-driven investment are reduced. If remittance recipients are targeted for extortion, migrants’ incentive to send money home may be reduced. Corruption can also block the reintegration of highly skilled returnees in developing countries and obstruct knowledge transfer. This could happen, for instance, if nepotism trumps merit in hiring processes, or if corrupt practices prevent professionals from being able to put their knowledge to use. Many highly skilled returnees are motivated by a desire to make a contribution to their country of origin. Obstacles in the form of corruption can be severely demoralizing. The desire to move abroad is often driven by a lack of faith in local opportunities. If corruption and nepotism are perceived to undermine meritocracy, it is a plausible reaction to turn towards opportunities elsewhere, especially among the highly skilled. This direct effect on individual migration decisions comes in addition to the negative indirect impacts of corruption on the economy or on security. Widespread corruption can hamper economic development and undermine the rule of law. The resulting poverty and insecurity can in turn stimulate the wish to leave. In countries that struggle with high-level corruption, the few at the top who stand to benefit often develop transnational connections. Earnings from corruption can make international migration possible, even from states whose passports are of little help for international travel. Corrupt elites also have particular motives for transnational mobility, deploying their wealth out of reach, or even preparing for a quick exit if prosecution is looming. A case in point is the “naked official” phenomenon in China—powerful men who profit from corruption and have sent their families and money abroad as a hedge against a change in fortunes. The research literature shows that many migrants experience culture shock upon return, often prefer self-employment, and face challenges in re-establishing a livelihood. If migrants have adapted to the less-corrupt society in the destination country, the corruption in the country of origin may be a reason for them to not return and can instill a sense of alienation from the homeland. Requests for bribes by border-control officials have even been found to complicate short return visits and frustrate migrants. For long-term settlement upon return, corruption can substantially complicate the process of establishing and running a business, and therefore makes economic reintegration more of an uphill struggle for many returnees. In post-conflict settings, corruption can disrupt property restitution mechanisms or reintegration assistance and thereby discourage the return of refugees. When migrants retain close ties with their countries of origin, they regularly transmit norms and values, known as social remittances, in a diffusion process from the destination society back to the origin country. Since migrants tend to move from high- to low-corruption countries (according to survey indices) they might develop a more critical view of corrupt practices and thus contribute to the spread of anti-corruption norms in their communities of origin. These are tenuous mechanisms that are difficult to document, but they are not unlikely in view of existing research on migration and social change. It is also possible, of course, for migrants from high-corruption countries to bring corrupt practices with them to destination states. If this occurs on a substantial scale, migrants may undermine the very social model that attracted them there. Migration often transforms societies of origin, not least through remittances and return migrants. Where landowners and public officials were key power holders in the past, transnational connections can catapult other individuals and families to prominent positions. Such changes may upset entrenched structures of patronage and nepotism, with positive consequences for the fight against corruption. On the other hand, the inflow of migrant money might also produce new forms of corruption. The social changes brought about by migration represent an opportunity when it comes to transforming or eradicating entrenched corruption. While the two previous points indicate that migration and transnationalism can reduce corruption, the opposite is also possible. The key term here is selectivity of migrants. If people who emigrate from countries with widespread corruption are voting with their feet—protesting against what they find unacceptable—the result may well be a kind of “morality drain.” That is, migration deprives society of voices that could have contributed to the fight against corruption. Such an effect would mirror the detrimental effect of brain drain. In highly corrupt settings, migrant assistance may be challenged in a number of ways. Most obviously, corruption can directly undercut program effectiveness, for instance if funds are embezzled, diverted to bribes, or depleted by inflated procurement costs. But there are also other mechanisms at work. In corrupt settings, prospective beneficiaries disappointed by the assistance delivery may attribute perceived shortcomings to corruption, correctly or not, as in the Iraqi example described below. That perception may tarnish the entire program. Yet another mechanism sets in when anticorruption measures become overly cumbersome, diverting resources away from their most effective uses. These ten mechanisms are all plausible, but their relative importance is difficult to assess. For instance, how does perceived corruption compare with other influences on migration desires? The answer depends on context. To elaborate, the corruption-migration links are examined in three specific cases. There is a well-established Nigerian system of human trafficking for prostitution in Europe, originating mainly in Edo State. The system runs largely on corruption. For Nigerian human traffickers, corruption is present throughout the stages of recruitment, transport, and exploitation abroad. Traffickers rely on bribes to keep their business running, by paying off public officials to turn a blind eye, and buying genuine passports under the table to lure victims eager to leave the country. Corruption is endemic in Nigeria, and undermines the rule of law the state is meant to provide and ultimately the state itself. Weak institutions offer little protection for victims and small risks to trafficking networks. Such trafficking flourishes because there are financial advantages for so many participants beyond the traffickers themselves, including public officials in Nigeria and those tasked with immigration control in transit and destination locations. The whole industry encourages the entrenchment of corrupt social structures to facilitate the trafficking networks. This example most obviously pertains to the first link, corruption facilitating illegal migration. Moreover, the pernicious impact of corruption on economic development and security in Nigeria also foments aspirations to migrate, as described in the fourth point that corruption stimulates migration desires, and these aspirations are capitalized on by traffickers. In 2008, Norway established the Information, Return, and Reintegration of Iraqi Nationals to Iraq (IRRINI) program, designed to encourage rejected Iraqi asylum seekers to return home. Implemented by the International Organization for Migration (IOM), the program offers free airfare to Iraq, a cash grant upon arrival, and subsequent in-kind assistance, such as help to establish a business. As of early 2015, more than 2,300 Iraqis had returned through IRRINI. An evaluation of the program identified several challenges, including the impact of general corruption in Iraq on the program’s effectiveness. First, the cash grant distributed at the airport in Iraq was set in Norwegian kroner but paid in U.S. dollars and therefore subject to fluctuating currency exchange rates. 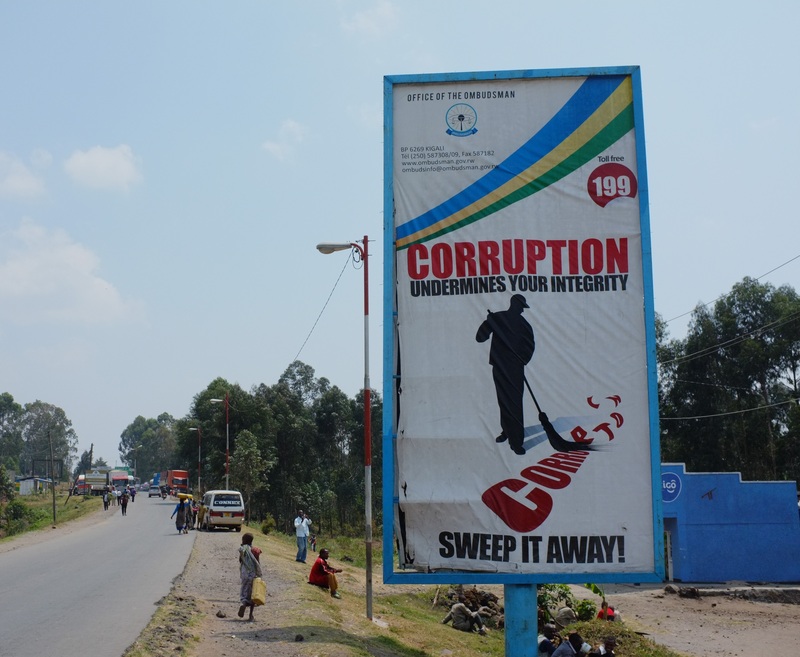 In a region where corruption is widespread, interview data showed that returnees who realized they had received less than others quickly attributed this to corruption. Second, in order to obtain IOM’s help in setting up a business, returnees were requested to provide a number of official documents and three price quotes from different suppliers for the intended goods to be sold. This was surprising to many, who reported to have been uninformed about such requirements prior to return. It was also a gargantuan challenge for some, partly because gathering independent price quotes is alien to the local and more informal business culture. Ironically, subsequent research reveals that some frustrated returnees now pay third-party fixers to fabricate quotes and help them establish fraudulent businesses to get the in-kind assistance and turn it into cash. Third, those who got their papers in order then had to wait as IOM verified them at headquarters—in another country. Thus, standard anticorruption mechanisms hampered the delivery of services and enraged returnees who had failed to receive asylum in Norway and were now eager to move on with their lives. To the extent that one agrees with official rhetoric portraying assisted return programs as good for development, this example illustrates the third link that corruption impedes the development benefits of migration. Either way, it demonstrates point number ten, that corruption (and anticorruption measures) can undermine assistance to migrants. Many migrants leave Latin America in search of better economic opportunities, sending remittances to support those left behind. While remittances can improve living conditions for recipients, they may also make them a target of corruption. Using data from the AmericasBarometer, a unique household survey of 24 Latin American countries, a recent study investigated the link between corruption (specifically extortion by the police) and an individual’s intention to migrate. Individuals in contact with corruption and averse to corruption, separately and together, exhibited a higher likelihood to migrate. A further study focused on whether the recipients of monetary remittances in 13 Latin American countries were significantly more likely to be extorted by police than nonrecipients. This extortion is thought to work through a “signaling effect,” where receiving remittances signals more wealth or liquidity to potential extorters. Remittance recipients were more likely to be extorted in several of the countries studied than individuals who do not receive remittances. In almost all countries men were more likely to be extorted than women. Highly educated individuals were also, in most cases, more likely to be extorted. These studies demonstrate how potential benefits resulting from migration can be stymied by corruption, as well as corruption’s place as a migration push factor. The AmericasBarometer-based study is directly linked to the ninth point, with migration sustaining corruption through “morality drain,” while the second study is linked to the third connection, corruption impeding the development benefits of migration, here through the targeting of remittance receivers. Migration and corruption affect one another. The effects of migration on corruption are unpredictable, and sometimes contradictory. Migration can reduce corruption through some mechanisms and sustain it through others. In the other direction, corruption may fuel migration desires, directly or indirectly, and increase an individual’s ability to migrate despite restrictive policies. The two-way relationship between migration and corruption adds another layer to the already complex migration-development nexus. The concerns of migrants, destination communities, and societies of origin emphasize the importance of fighting corruption. However, corruption is often systemic, and hawkish approaches that point to corrupt officials as “bad actors” who can be blamed for the hardships of migrants must be examined carefully and in context. How migrants view and experience corruption will differ from case to case. Since corruption shapes migration in a number of direct and indirect ways, and vice versa, theories of migration that do not incorporate corruption miss out on an important piece of the empirical puzzle. Billand, Alexandra and Melissa Siegel. Forthcoming. Remittance Receipt and Bribe Extortion by the Police in Latin America. United Nations University-Maastricht Economic and Social Research Institute on Innovation and Technology (UNU-MERIT) Working Paper Series. Carling, Jørgen. 2005. Trafficking in Women from Nigeria to Europe. Migration Information Source, July 1, 2005. Available Online. Missbach, Antje. 2014. Doors and Fences: Controlling Indonesia's Porous Borders and Policing Asylum Seekers. Singapore Journal of Tropical Geography, 35 (2): 228-44. Paasche, Erlend. Corrupting Return? How Grand Corruption in Iraqi Kurdistan Affects the Reintegration of Returnees from Europe. Unpublished manuscript. Shelley, Louise. 2010. Human Trafficking: A Global Perspective. New York: Cambridge University Press. Siegel, Melissa and Felice Bakker. Forthcoming. Linking Migration and Corruption: The Potential for Morality Drain. UNU-MERIT Working Paper Series. Strand, Arne, Synnøve Bendixsen, Erlend Paasche, and Jessica Schultz. 2011. Between Two Societies. Review of the Information, Return and Reintegration of Iraqi Nationals to Iraq (IRRINI) Programme. Chr. Michelsen Institute Report R 2011: 4. Bergen: Chr. Michelsen Institute. Available Online. Transparency International. N.d. Corruption Perceptions Index 2012. Accessed March 1, 2015. Available Online. ---. N.d. FAQs on Corruption. Accessed September 17, 2014. Available Online. Jørgen Carling is a Research Professor at the Peace Research Institute Oslo. Erlend Paasche is a Researcher at the Peace Research Institute Oslo. Melissa Siegel is Head of Migration Studies at the Maastricht Graduate School of Governance and UNU-MERIT.